Yoga provides a number of benefits for both the body and mind, from flexibility to relaxation, and we offer a variety of classes to help you experie nce them. Whether you’re just beginning or an experienced practitioner, there’s a class for everyone, and with over 25 classes a week, we make it easy to fit yoga int o your day. Check out the full list below or sign up for a free class! No problem! Be sure to wear comfortable clothes that you can freely move in and bring some water for after class. Don’t worry if you don’t have a yoga mat, we have rentals available. Hatha Yoga is the unheated, traditional form of yoga and encourages proper alignment of the body, bringing balance, strength, and calmness to the practitioner. 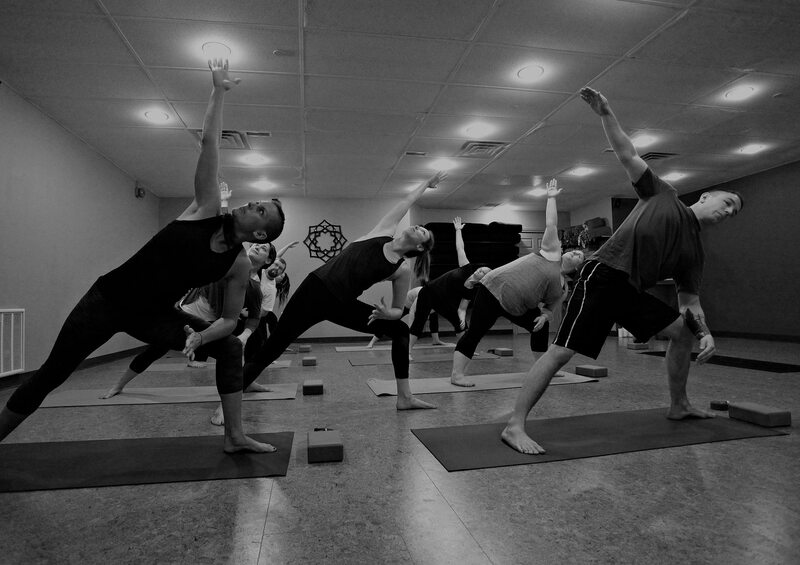 Hot Yoga is performed in a heated room, typically between 32–37°C. Get ready to torch calories, tone your body, and relax your mind! Revive Yoga is similar to Hatha Yoga but performed at a more relaxing and restorative pace in a lightly heated environment. Aided by the support of a chair in an unheated room, Chair Yoga is specifically designed for seniors and those with limited mobility. Focused solely on grounded poses, Yin Yoga allows you more time to sink into a posture for a deep stretch of your body’s connective tissues. Fun and interactive, Aerial Yoga uses silks that are secured to the ceiling to allow the body to move deeper into a pose. Perfect for a unique bachelorette party! A fantastic way to gently prepare the mind and body for the birthing process, Prenatal Yoga is unheated and suitable for all stages of pregnancy. Get your office, group, or friends together for a private lesson—great for team building. We’ll even come to you! Private lessons are also available for those looking for 1-on-1 instruction. Call us to book! A one-of-a-kind bachelorette party experience using our Aerial Yoga silks! It’s a perfect way for the bride-to-be to unwind and relax with her favourite people before the big day. No experience necessary! Throughout the year, we host a number of exciting, highly anticipated events, including workshops, meditations, outdoor sessions, and parties!